Create a personalized plush fleece blanket with your favorite photos and relive your treasured memories everyday! Get your creative juices flowing and build a stunning plush fleece blanket to keep you snuggly and warm while relaxing with your family and friends on your living room sofa. Not only will our photo blanket display your best pictures in a unique way but will make the perfect throw for your bed, couch or favorite chair. With multiple styles to choose from, you can easily create a blanket that fits your personality and style. Check out our full photo blanket collection for more options and materials including our jersey fleece and woven tapestry blankets. Building your blanket is as easy as 1-2-3. Simply upload your photos and create your layout. Creating your personalized blanket masterpiece can be done with the following steps that are both easy and fun. Check out our complete line plush fleece blankets, for additional sizes. Begin by gathering your photos and uploading them into your account. In addition to your computer and mobile devices, you can use our built-in Facebook and Instagram account connections to use your social media pictures for your blanket’s photo layout. Then, choose either a portrait or landscape orientation. Afterwards, pick out your background design and begin dragging your photos onto your layout. You can even add your own text for a more personalized look. Once you have completed your layout, review your design and proceed to the checkout page to place your order. After your large plush fleece blanket arrives, you can use it as a stylish throw and add a little color and character to your living room sofa. Your new photo blanket is the perfect size to snuggle with the entire family on the couch on a cold evening. Combing comfort and personality, your plush fleece blanket will become your favorite new decorative accessory. Are you looking for a fun and unique way to showcase your most beloved memories? Maybe you have some candid family snapshots or a series of wedding photos that would make the perfect collage for your new plush fleece blanket. Create your blanket using one of our multiple photo layouts and backgrounds and design it to perfectly match your home decor and distinctive personality. With its ultra soft fleece material, your blanket will not only keep you warm and cozy while relaxing on the couch but will allow you to relive your beloved memories time and again. 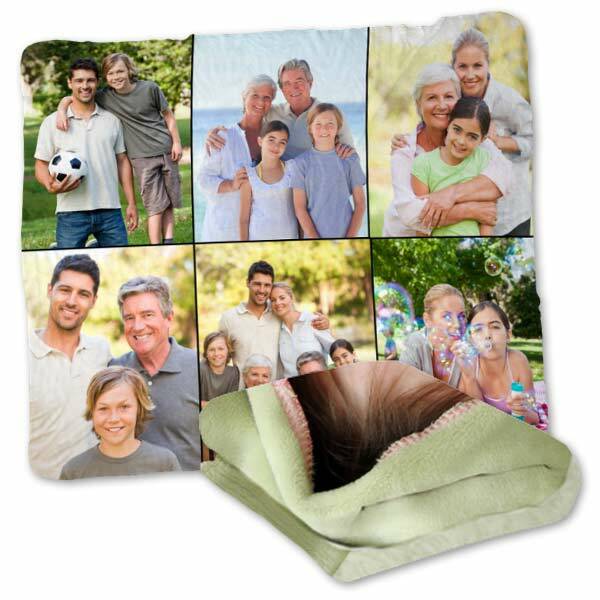 Our 60×80 plush photo blankets are just the right size to keep the whole family warm. Snuggle together while enjoying a favorite movie or on game night for an evening of cozy fun. To complete the look of your living area, check out our full line of home decor gifts, including photo pillows and large area floor mats. We have a wide variety of items that will allow you to show off your pictures in style! Are you looking for the perfect gift that is both unique and personal? Maybe your sister is moving to a new home and you’re looking for just the right housewarming gift. Or, your parents are celebrating their wedding anniversary. No matter the gift-giving occasion, a large photo plush fleece blanket will certainly fit the bill. Find their favorite images and add them to a custom layout for a blanket that they will admire and enjoy using on a chilly evening. Use our project builder to create a blanket masterpiece that shows off your loved one’s most cherished memories and compliments their decorating style. Whether it’s a birthday present, a housewarming gift or simply just because, our large plush blankets are sure to be a big hit with both family and friends alike. For an unforgettable gift set, check out our custom pillow collection that includes several sizes perfect for anyone’s home. Both a personalized plush blanket and a photo pillow will make a gift set that’s hard to beat. With just a few easy steps, you can create a photo blanket using your favorite photos that will provide you years of comfort. Select your most cherished pictures and create your blanket for an exciting display your most life’s most memorable moments. Showcase your best wedding photos, vacation pictures or your kids’ school photos and snuggle up on the couch with your most treasured remembrances. 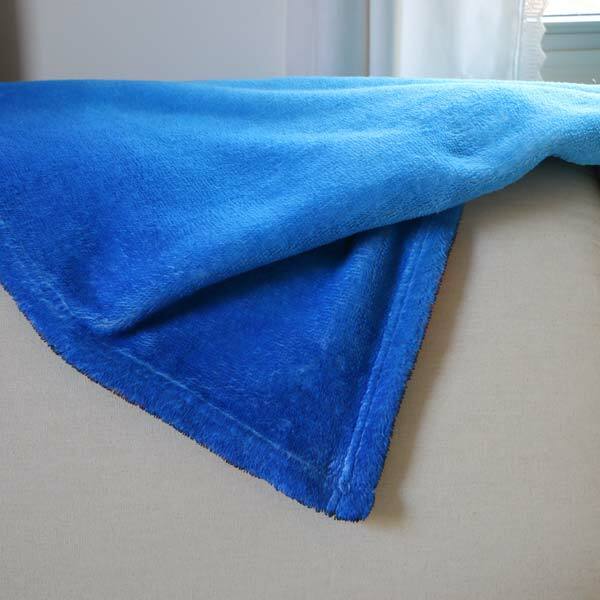 Your plush fleece blanket will make the perfect throw for your bed or living room sofa. Not only will it add color and personality but will provide you and your loved ones with day after day of cozy warmth. If you’re searching for the perfect gift, why not create something personalized. A custom photo plush fleece will make a gift that is both heartfelt and practical.. No matter the occasion, a 60×80 plush fleece blanket will certainly fit your style and personality to a “T”.